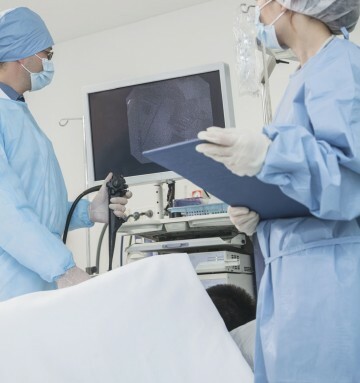 An endoscope is a long, thin tube with a light and a camera at the end. It is passed down your throat and into your digestive system. Endoscopy can show blockages or swelling in the pancreatic ducts and allows the doctor to judge whether these problems are caused by cancer or not. During the procedure, doctors can also take samples of the tissue or fluid to help them find out if you have cancer. This is called a biopsy. 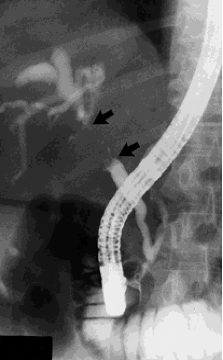 A dye may be injected in the pancreatic bile ducts via the endoscope, so that these organs can be viewed as x-ray pictures, known as cholangiograms. This procedure is known as endoscopic retrogade cholangio-pancreatography (ERCP). The day before your ERCP, you may need to attend a pre-admission clinic so that some blood can be taken for tests. You will need to tell the staff if you suffer from diabetes or glaucoma or take Warfarin. You must have nothing to eat or drink for at least 6 hours before your test. When you go into hospital, the doctor will put a small needle into the back of your right hand so that you can have some sedation. You will then need to lie on your left-hand side with your left arm behind your back. The nurse who is looking after you will place a clip on your finger that monitors your pulse rate and oxygen levels. You may also be given some oxygen through a mask. The doctor will pass the endoscope tube down your oesophagus into your stomach. The tube then passes into the first part of your small bowel (the duodenum), where the opening to the ducts leading to the liver and pancreas are. The doctor then passes a narrow plastic tube, called a catheter, down through the endoscope and into this opening. If the doctor sees any abnormalities, he/she will take a biopsy. Cell samples, called “brushings”, can also be taken from inside the small ducts. The biopsies and/or cell samples will be sent to the pathology department and examined closely under a microscope. It will take several days before the results are known. The doctor may take some photographs of the area for closer examination later. The test can take between 25 – 30 minutes. You will go back to the ward in your bed and a nurse will check your pulse and your blood pressure regularly until you are fully awake. You may feel sleepy for a couple of hours because of the sedation. After you have been back in the ward for about 2 hours some blood will be taken to check if there has been any irritation to your pancreas (pancreatitis) after your ERCP. Until the result of your blood test is known, you will be not be able to eat or drink anything. You might be able to have fluids via a “drip” in your hand in the meantime. If you develop pancreatitis, you will need to stay in hospital until it settles. You will also need to stay in hospital overnight, if you have had a stent put in. If you are allowed home on the same day as the test, then you will need someone to look after you for the next 24 hours. It takes this long for the sedation to leave your system and during this time you must not drive, or operate heavy machinery, make any important decisions or take any alcohol. Endoscopic ultrasound (EUS) is a type of endoscopy where the doctor uses a thin flexible camera with a small ultrasound probe at the tip. During the test, the doctor will look at the lining of your pancreas, as well as examining the lymph nodes. Everything will be magnified on a television screen and images will also appear on the ultrasound machine. If necessary, your doctor will take samples of cells from the surrounding areas, by means of a fine needle aspiration(FNA) and send them to the laboratory for examination. You cannot eat or drink for several hours before an endoscopy. You will have a sedative and local anaesthetic to make you feel as comfortable as possible. Because of the sedative you should not drive or operate machinery for 24 hours. The test takes between 20 – 30 minutes. If you have had biopsies taken it may take 7 to 10 days before the results are available. Before you leave the hospital after your endoscopy, make sure you have an appointment to come back and see your doctor for the results. If, after the procedure, you develop a high temperature, have difficulty swallowing or have increasing throat or chest pain, contact your doctor immediately.